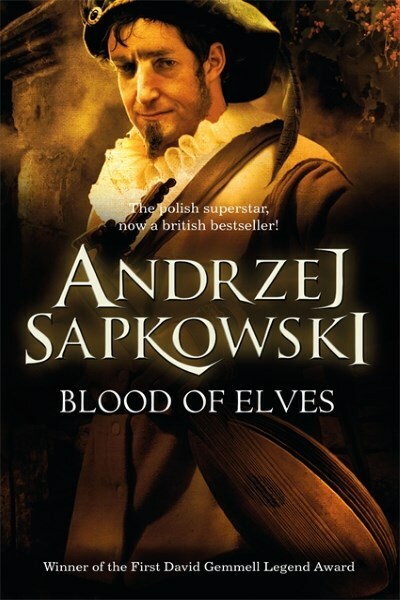 Blood of Elves by Andrzej Sapkowski is the second novel in the re-issued editions of the Witcher series by Gollancz Press. It is preceded by The Last Wish, a collection of short stories written after Blood of Elves but which take place chronologically before the events of that book. There have been many editions of the Witcher books, and with new books in the series continuing to come out, some of which are set before, some after, and some in between other books in the series, it’s a difficult task keeping the exact order straight. In any case, here we have Blood of Elves, the book that really gets the overarching Witcher storyline started. The fact that there even is an overarching storyline was a bit of a surprise to me. Coming into this series, and given what I know from the various Witcher RPG’s and video games, I was expecting something that focused on our main character, Geralt?of Rivia, monster hunter extraordinaire, doing what he (presumably) does best: hunt monsters. Instead we are introduced to a small cast of supporting characters who somehow take on the roles of main characters, as if this series?is not principally about the Witcher at all. There’s the beautiful and powerful sorceress, Yennefer, who is also Geralt’s love interest; Ciri, who is your basic Chosen One; and Dandelion, a bard who survives by his wit and charm and only then just barely at times. There’s also Geralt, of course, but—and herein lies the single biggest problem I had with Blood of Elves—we hardly get to see him. The story is really about Ciri and the various political and other machinations which come into play because of her importance. Geralt pops in here and there, but his contribution is surprisingly minor. It’s almost as if he’s really just a supporting character and not the main hero of our series at all. Geralt’s absence is not the only aspect of Blood of Elves that doesn’t work. There’s also the somewhat disjointed story itself, which jumps back and forth from Ciri and her Witcher training to the mounting tension between the different races to Yennefer and her plans to tutor Ciri. If only Mr. Sapkowski had featured Geralt more prominently, I think this second book in the series could have earned a higher rating from me. As it stands, I’m giving Blood of Elves two rockets. Not a bad read if you’re interested in reading the entire series but nowhere near a must-read for fantasy fans in general. I do want to thank Gollancz Press once more for providing the complete series to me in paperback format as a surprise Christmas time giveaway last year. I’m continuing with the series, so look for my review of Time of Contempt soon. At first, Quietus by Tristan Palmgren reminded me a lot of the excellent Doomsday Book by Connie Willis. The basic premise is about the same: anthropologists from another world (dimension in the case of Quietus and time period with respect to Doomsday Book) visit 14th century England just as the Black Death is taking hold and laying waste to civilization. In the case of Doomsday Book, the main character arrives in 1348 by mistake. In the case of Quietus, our main character, Habidah, is exactly where she wants to be or, rather, exactly where her superiors want her to be. In her dimension, a plague very similar to the Black Death is ravaging entire worlds, and so Habidah and her team are sent to study the 14th century version of the disease and the effects it has on the populace in hopes of developing a cure for their version of it. Turns out they’re not being told everything, and so the plot becomes much bigger, the stakes higher, and, for the medieval people Habidah begins to develop a connection to, the danger much greater. Backing up, Quietus begins with great promise. Habidah is a likable character, the leader of a team whose mission is to study and record; they are not to intervene under any circumstances. Despite the tragedies they must witness over and over, their purpose is not to cure the medieval version of the plague or to assist the people affected by it. This is a tough pill to swallow for our dimensional travellers, but they do it because they must. Habidah, however, is blessed (cursed?) with a conscience that will not allow her to stand by and do nothing. A small infraction is reprimanded with a slap on the wrist and a warning not to do it again. A second violation, more serious this time since she brings a certain monk onto her ship for treatment, sets the story on an entirely different course from where we started. Quietus truly becomes interesting at this point and wholly diverges away from the premise set forth in Doomsday Book. Niccolucio, the monk whom Habidah rescues from certain death, is just as interesting a character as Habidah. Raised to affluence, he forsakes his family fortune for the simple life of a Carthusian monk. But when he is forced to care for his brothers as they die one by one, he begins to question his god’s purpose and his own. When he learns the truth about Habidah, or at least the version of the truth she reveals to him, his path becomes something unexpected as he plays a major role in the unfolding of the bigger and primary storyline revealed later on. There are other supporting characters, none of whom really made an impression on me, as well as some other subplots that were mostly stereotypical and not really needed to support the main storyline. The writing is good but didn’t strike me as exceptional. Mr. Palmgren’s prose does the job but won’t knock you off your feet. I want to thank the publisher for giving me a free electronic copy of Quietus via Netgalley in exchange for a fair and honest review. I’m giving Quietus three rockets because, while a good read with some likable characters, ultimately the story meandered a bit too much for my liking. Niccolucio’s awakening was of particular interest, but it goes off-track when certain entities interpose themselves. It was almost as if the story became maybe a bit too complex; that extra level was not needed. 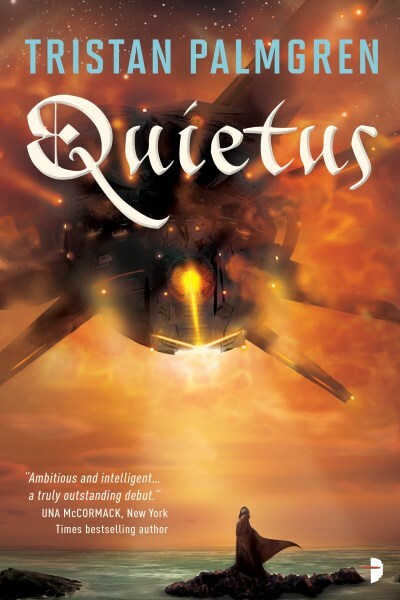 In any case, I enjoyed Quietus and recommend it quite readily. Starlight gives way to bolder neon. Signs muscle in on all sides, brightly welcoming each arrival to New Horizon. The Vagrant does not notice; his gaze fixes on the ground ahead. So begins The Vagrant by Peter Newman, a literary work that is bold, dismal, groundbreaking, and genre defying all at once. It’s concisely written yet full of beautiful prose, and features a menagerie of characters, some good, some evil, and many who fall somewhere between. The central figure is, as the title suggests, the man known only as the Vagrant. Beyond him and a pair of ever present companions (a baby and a goat, of all things), there is little consistency to the cast of personas; the Vagrant is on a mission which necessitates that he remain on the move and, in doing so, hardly won alliances are often shattered as the Vagrant does what he must do to keep himself and the baby he protects alive. The world the Vagrant walks is a dark, dismal one, made so by the horde of monsters that emerged from the Breach to enslave and otherwise make ill use of humanity. In this ongoing struggle, few can stand against the monsters. The Vagrant is, not surprisingly, one of them, but only because of the sword he wields, a relic of an order that has been laid low by the monsters and their infernal leader, the Usurper. The Vagrant’s story unfolds over the course of the novel as we are treated to glimpses of his past, how he acquired a Seraph Knight’s sword, and how he came to travel with a baby and a goat. The baby actually influences many of the Vagrant’s decisions. The goat, not so much, though he does view the goat as a companion of sorts and looks out for him as such. The last thing I will say about the Vagrant is that he is a mute. This isn’t immediately obvious; while he doesn’t speak early on in the book, the prose is such that the reader is left to wonder if this is merely a tact the author means to explore for as long as he can. Later it is revealed, however, that he cannot speak. It’s an interesting aspect of the character which allows the author to explore situations in entirely different ways since the Vagrant cannot simply explain himself or his intentions verbally. The writing is somber and dark in the vein of The Road by Cormac McCarthy, yet leavened at times by the presence of the Vagrant’s companions. The goat is flat out hilarious at times, often inserting himself into the middle of situations (especially if there is food to be had), and the baby brings with her a sense of hope that only a baby can bring. Yet the world as a whole is a dark, dismal place, where seemingly well intentioned characters can and will change allegiances to suit their own needs. Yet even in the darkest places there can be light as we find with a certain abomination-like character. I’m giving The Vagrant four rockets. It very nearly received five, but there was a point in which I felt the story dragged somewhat. Still, this first installment in The Vagrant Series is a must-read if only because of the uniqueness of the main character and genre-blending aspects of the world he walks. There are aspects of fantasy, science fiction, horror, and dystopia, all blended together in a way that is both horrible to experience yet refreshing from a non-traditionalist’s point of view. 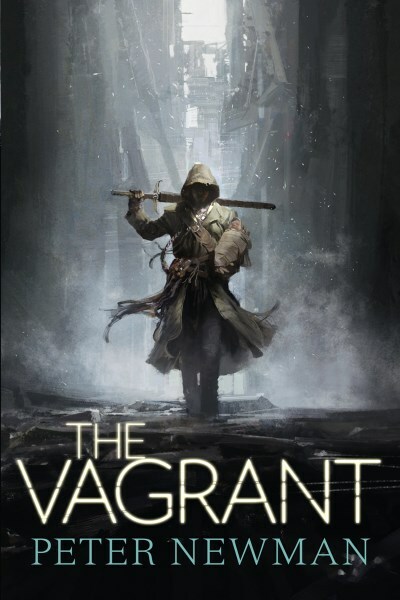 The Vagrant has much more story in him, I feel, so I will be purchasing the next two books in the series soon. 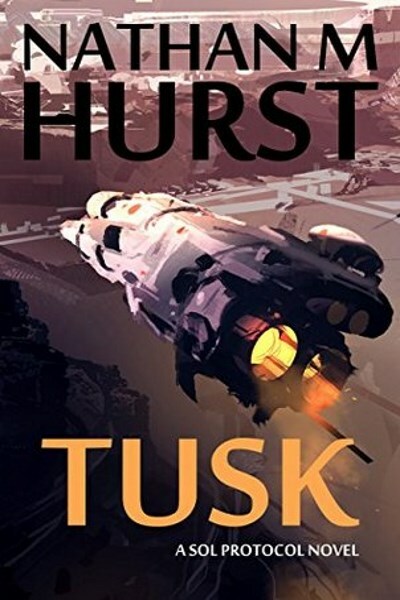 On the surface, Tusk by Nathan M. Hurst follows a familiar formula: Earth is dying and the human race with it unless an ambitious plan to colonize a distant planet succeeds. Any experienced science fiction reader has been here before, with an Earth that has been used and abused by its dominant species to the point where it is fast becoming uninhabitable. The only way to save the human race is therefore to travel across the stars to start over on an uninhabited planet. Tusk doesn’t really break from this formula at any point, but it does throw in enough curve balls, mysteries, and a fair level of suspense that it’s an enjoyable, fun read that kept me turning the pages. Humans are able to travel vast distances across space only because of the pioneering work of one scientist who develops sophisticated cloning technology and, even more impressive, a way to transfer the consciousness of an individual from one body to another. This, in effect, means humankind has achieved immortality; as a person’s body reaches the end of its life, that person’s consciousness can be transferred to a new, young body and theoretically live forever. While the philosophical or religious implications of this are never really mentioned nor explored, I really didn’t miss a deep dive in this direction. Instead we get a practical means by which those onboard the three ships sent by Earth can travel indefinitely until they finally reach their destination. That destination is a place called Hayford b, a system that contains a livable but uninhabited planet ready and waiting for the colonists arrival. Of course things aren’t what they seem and so the first crew to begin awakening discovers one of their sister ships, the UTS Intrepid, unresponsive. They soon learn that all comms are jammed around the ship and that, even worse, she’s been boarded by an unknown party. I won’t go into a lot of plot details because it’s too difficult not to give something away, but suffice to say the Intrepid’s boarders do not have the best interests of the colonists in mind. Throw in some additional sub-plots, more than a few battles, and a big assumption that gets turned on its head, and you’ve got a pretty enjoyable science fiction story to look forward to. The writing is good and concise in a way that doesn’t waste a lot of words or spend a lot of time with ‘filler’ descriptive prose; you’re going to get a lot of straight up drama, action, and suspense with Tusk. As for the characters, there are a lot of them, which, on one hand, is to be expected given the size of the colonization ships. While it’s sometimes difficult to keep them all straight, the variety allows the author to explore many different aspects of the mission and the various storylines. The AI is especially intriguing as a character. Her depth was refreshing and somewhat unexpected. All things considered, I liked Tusk enough to give it four rockets. As mentioned, the main plot is not original, but the writing, characters, and storylines all combine to present a science fiction novel that will intrigue and draw you in. One final note: Mr. Hurst contacted me via Twitter to request a review of Tusk. I obliged by purchasing my own copy of the Kindle edition of the book. I have since also purchased the next book in the series, Clarion, which I’ve added to my TBR list and will review sometime in the near future. 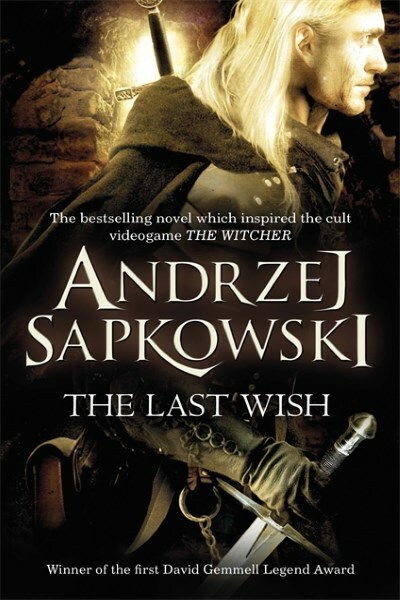 The Last Wish by Andrzej Sapkowski is a book I went into with mixed expectations. On the one hand, I am somewhat familiar with the Witcher from the video games (I’ve never played the games, but it’s hard to miss the advertising and I do like watching the game trailers). On the other, even though the books came before the games, there’s still a negative preconception that books having anything to do with a video game are of lesser quality than a book that is not. This is not fair in all cases, of course, but it certainly is in some. Regardless, after Gollancz Press sent me the entire series of Witcher novels after winning them via a Twitter drawing, I felt obligated (and, quite frankly, intrigued, because I love the premise of a supernatural hunting badass tracking down and killing monsters) to give this book and the rest in the series a fair shake. The Last Wish is novel length, though it is not a novel per se but rather a collection of varying length stories that more or less follow a chronological order. From what I could gather from the Witcher Wiki, the stories contained in The Last Wish were first published in now out of print magazines and later gathered together into this collection. Also, The Last Wish is a prequel in that the stories take place before the main series of books. That being said, the editions I received from Gollancz are part of a reprinted series, so they conveniently designated The Last Wish as book one. It’s all a bit confusing, truth be told, with there being so many editions and instances where the series has been rebranded. All of that aside, I enjoyed The Last Wish. I’m not going to say it blew me away, because it didn’t. But it did surprise me with the depth of some of the stories. On the surface, the Witcher, Geralt, hunts monsters. But the monsters are not always what they seem. They’re not just simply monsters, in other words. Some other witchers might ignore this and go ahead with their duty regardless. But Geralt has a streak of kindness or mercy in him that makes him want to understand the plight of the monsters he hunts. If he has to kill his prey, he will. He has the magic, the silver, and the steel to do so quite efficiently. But if there’s another way, he isn’t afraid to explore it. Nowhere is this demonstrated better than in the story “A Grain of Truth,” where Geralt finds himself facing off against a powerful creature that is more beast than man. Yet once the tension of their initial confrontation is defused, Geralt discovers that not only can the creature talk, but that he has a name. Nevellen soon tells him a tale of a curse and a lonely existence that, in the end, turns out to not be the entire truth but enough that Geralt must make a hard choice. It’s an excellent demonstration of just what the Witcher stories are really all about in that there’s more to some of these monsters than what’s on the surface. Other stories follow a similar thread or even present opportunities for Geralt to form real relationships, including friendship and love interests. The final story, which bears the same name as the title of the book, is the grandest of all. In it we are introduced to Yennefer of Vengerberg, who must choose between ambition and love when the opportunity to capture a genie presents itself. I liked The Last Wish enough to give it a three rocket rating. None of the stories knocked me off my feet, but they each drew me in and kept me reading. I would have liked to have seen a grander demonstration of the Witcher’s magic or ability with a sword, both of which we do see, but just not in any great detail. Also, even though The Last Wish is the beginning of the Witcher series, Geralt is already accomplished at his trade. While I wasn’t expecting (or desiring) a full origin story, I think the series as a a whole would have benefitted from picking up earlier in Geralt’s career so we as readers could experience some of his early struggles and wins. In any case, The Last Wish fulfills the promise of introducing us to the Witcher and his way of life, enough so that I recommend reading this one and picking up the next book, Blood of Elves, to see what other adventures Geralt may find himself on.